Today, America spends more on defense than at any time since the end of World War II, based on the Pentagon’s own official budget data. The previous high point in post-World War II defense spending was 1952 – during the Korean War – at $589 billion in today’s dollars. The Pentagon’s budget request for the current fiscal year totals $670 billion, or a substantial 14 percent above the previous high water mark. U.S. defense spending is now also larger than the rest of the world – combined. The CIA’s 2007 Word Fact Book estimates all other nations to spend about $400 billion on defense. That amount is for not just our potential opponents, whoever they might be; that’s the entire rest of the world. We are told we must worry about China and Russia and prepare against them; something we should really lose sleep over is how they can be such a major concern – to those who point them out as looming threats – with defense budgets of just $81 billion and $21 billion, respectively, according to the CIA. A similar basis for worrying is why the Pentagon’s budget has trended up over the decades, while its forces have been shrinking. Today, we have the smallest defense inventory since 1946. For example, with a spending level considerably higher than in 1985 when the Cold War raged and after Ronald Reagan increased the Defense Department’s budget, we have now 10 active Army divisions, not the 17 we had in 1985; less than 300 naval combatants – compared to 542 in 1985, and we have just over 12 active Air Force tactical air wings, not 25. A major reason is incompetence. According to the “scorecard” of the Office of Management and Budget on how well U.S. agencies are run, the Pentagon has ranked among the worst since the ratings began. By bad management, don’t think of just “waste, fraud, and abuse” and incompetent book-keeping – the measures OMB uses. Add to those the incessant decisions in the Pentagon and Congress that favor bureaucratic and selfish interests, rather than the needs of war. Those latter factors provide most of the explanation for why the Pentagon budget delivers less for more. Consider just one example; the Air Force’s F-22 fighter aircraft. It began in the early 1980s as the Air Force’s solution to maintaining air superiority over the Soviet Union during the Cold War. However, a lot of history unfolded between the “Raptor’s” conception back then and the Air Force’s announcement on December 12, 2007 that after more than two decades of development the F-22 had finally reached “full operational capability,” meaning that it was ready to go to war. There is, however, no war for it to go to. While there are, of course, two very real ones in Iraq and Afghanistan, the F-22 is yet to fly a single sortie over the skies of either country. Nor has the Air Force announced any intention to send the F-22 to either theater. The Air Force is quite right to keep the F-22 far away from those conflicts. The airplane is irrelevant to both, since its primary mission – to shoot down enemy aircraft – is useless against our opponents – al Qaeda, the Taliban, and other insurgents – who have no air force and don’t want one. Worse, if the F-22 were it to appear in those theaters, it would almost certainly harm our war efforts. It is not just that its huge logistics tail would strain our already overstretched support forces in both theaters. But also, the F-22 has operating limitations. While it can carry two medium sized bombs to attack ground targets, it is a capability so modest our opponents in Iraq and Afghanistan might not even notice. It would also be ungracious to compare the F-22 to the ridiculously cheap, simple A-10 close air support aircraft that is built specifically for the ground support role and that has been indispensable for supporting soldiers in combat in both wars. It would be even more bad-mannered to point out that each A-10 can deliver per day eight times, or more, the payload that an F-22 can. More to the point, the F-22 would be counter-productive. Data from Afghanistan indicate that U.S. and allied forces may have killed more innocent civilians than the enemy has in the past year, and from Iraq we read report after report of civilians killed as a result of US action. A major part of those “collateral” civilian casualties come from aircraft flying too fast and too high to positively identify exactly what they are guiding their munitions to. As such, the F-22 is too “thin-skinned” to endure ground fire, even from assault rifles, and it is too expensive to risk flying close enough to the ground to identify targets. In a form of conflict where winning over the civilian population is key to success, F-22 participation – along with that of other high flying, high speed aircraft – may help the enemy more than us. By keeping the F-22 at its US bases, the Air Force is doing our forces in Iraq and Afghanistan a great favor. Counter-productivity in 21st century warfare notwithstanding, the F-22’s advocates would leap to argue that in its intended role – shooting down enemy fighters – it is unsurpassed. Let’s pretend for the moment that there exists, or will soon, an enemy air force for which the F-22 would be relevant. How, then, could the F-22 help? We contend that as an individual performer in real world air-to-air combat, the F-22 is a huge disappointment. The Air Force vociferously disagrees – based on its hypothesis that air wars can be fought and won by long range, radar-controlled missiles fired at enemies you cannot see or visually – that is, reliably – identify. This “beyond-visual-range,” radar-missile hypothesis has been tested in real world combat, and it has failed repeatedly. If ever the F-22 finds itself in an air war against a serious opponent, all of us will find out who is right. Here, we will focus on three issues about which there can be little argument and that explain how the F-22 contributes mightily to our shrinking, less ready-to-fight forces, while bringing vastly increased cost. Force Size: Back in the 1980s, the U.S. Air Force planned to buy 750 F-22s to fight the Soviet air force. For development and procurement, Congress is generously providing $65.3 billion, a huge sum. However, because no stakeholder was interested in exercising discipline over the design, weight, and cost of each F-22, that $65.3 billion will only buy 184 aircraft, not enough to be a real threat to any major opposing air power. Moreover, given the need to maintain a training base in the US and considering the demonstrated daily sortie rate of similarly complex aircraft already in our inventory, the Air Force will be lucky to be able to fly 60 F-22 sorties per day at the start of an overseas conflict against a major opponent. That number will shrink as inevitable combat attrition and maintenance down-time take their toll. The force size that the F-22 program generates is simply too puny to register against the major air threat the F-22 advocates hypothesize. Pilot Skill: Unfortunately, we can expect that same tiny F-22 force to attrite all too rapidly in combat for the simple reason that the Air Force no longer adequately supports pilot training. F-22 pilots get only ten to twelve hours of flight training per month. When we provided 20 to 25 hours per month to train pilots for Vietnam, our pilots complained – rightly – it was inadequate. At the height of their prowess in the 1960s and ’70s, the Israelis gave their fighter pilots 40 to 50 hours of flight training per month. The history of air warfare shows all too clearly that the most important determinant of who wins and who dies in an aerial dogfight is pilot skill, not aircraft performance. Because they have raided pilot training accounts to feed increasingly voracious procurement programs (such as the F-22), Congress and the Air Force have virtually guaranteed high pilot losses for us in any hypothesized, large scale air war. If the advocates of more air power for the U.S. were serious about winning and saving American pilots lives, they would double, then triple, the amount of money available for pilot flight training before spending a single penny on new aircraft. Revealing its real priorities, in help pay for the pork it added to the 2008 DOD appropriations act, Congress cut air force training by $400 million. Time has not been kind to the F-22; neither to its costs, nor to its relevance. Even in the wars the F-22 advocates postulate against a Chinese or Russian air force, the F-22 is deeply flawed, and its ultimate impact is to degrade our most important assets in the air, our pilots and their skill. The most prominent mission that Lockheed and the Air Force are currently pushing to buy more F-22s is demonstrated in recent newspaper articles and advertisements. Nowhere do these talk about a dangerous new air threat that explains the need for more F-22s. Instead, they focus on the 44 states that will receive corporate spending and jobs. Put another way, it is Congress’ lust for pork and the perverted thinking that jobs and profits should drive defense spending, not the threat, that is driving the campaign to buy more F-22s. The overall defense budget is stuffed to the gills with similar examples. Budget-inflating, war-irrelevant, dubious-performing, and pork-ridden examples in the other military services include the Navy’s DDG-1000 destroyer, the Army’s Future Combat System, and the Marines Expeditionary Fighting Vehicle. In fact, such programs are now the norm; it is the war-relevant, cost-effective ones that are scarce to the point of extinction. There should be no doubt how we got to where we are. This entry was posted on March 23, 2014 at 7:23 pm	and is filed under Uncategorized. Tagged: center for defense information, the f-22 analysis. You can follow any responses to this entry through the RSS 2.0 feed. You can leave a response, or trackback from your own site. It doesn’t have a mission, so they’ll invent one for it. That seems to be the rallying cry around a lot of these weapons these days. That and the capabilities are always vastly overstated, while the costs are vastly understated. It is not so much incompetence as much as it is malice – a desire to funnel money into the defense industry that drives all of this. While the Air Force is bad I fear the Army more. So are we ready to fight Putin, and establish air superiority over Europe? Given the economic climate, can the US or the Western European powers afford it? Let’s not forget too that many European nations have close financial and economic ties with Russia. It is looking like not much will happen except a few cosmetic sanctions that don’t accomplish much. Things will change dramatically, once Putin charges into the rest of Ukraine. US & EU have never been richer; war will help the needed redistribution of riches, and, first of all, employment (only about half of employable people in USA-EU are employed, as the employment rate of the 24 to 54 years old is around 60%). It’s appalling that the Western powers seem to be in recession by choice. Austerity has been a massive failure. Youth unemployment is very high. Infrastructure (at least in North America) seems to be falling apart from age. And yet all of this could be fixed, simply by abandoning neo-liberal economics and pursuing something more egalitarian. There isn’t going to happen anything like a “war” between Russia and NATO. In the meantime, Putin withdrew his major forces from the ukrainian border, and new contracts about oil and gasoline with are already on their way. Not much going to happen besides some skirmishs near the russian border; all of them with little to no geopolitical significance. I’ve never quite understood how anyone could think there was a big, all-out war incoming. After all there are mainly two reasons for an open conflict; one of them being hatred, as a consequence of fear and disdain – these are in fact the major problems we’ve gotten ourselves into against these fundamentalistic idiots in the middle east. The other (more popular) one is greed. But right now there is no way that a war between, let’s say Russia and NATO, will not lead to a world wide economic desaster, that will ruin every single civilised country on earth. Our economies are just dependant on each other – to take one player out of the match would essentially mean to not only end the game, but to also break the whole game board apart. P.s. : I’m from Germany; English isn’t my mother language. Be nice to me if I make mistakes. P.p.s. : Very interesting blog btw. Is there a chance you’ll write an article about friend-foe-identification? I heard that the radar of the F-22 has the ability to provide it’s pilote some reliable information about the aircraft in his surroundings. Indeed. Both West and Russia would be at loss if there was to be a war, and I don’t think there will ever be any major sanctions either. F-22s and F-35s stated missions actually never existed, and even during Cold War these aircraft would have been militarily counterproductive (there wasn’t any chance of war with the USSR, and even if there was one, F-22s and ’35s complex design, massive maintenance downtime, reliance on fixed air bases / aircraft carriers and high operating costs would have meant small number of aircraft produced and even smaller number of sorties flown, so the F-15 ad F-16 would have been the primary combatants anyway). And yes, T-50 – while a better design, at least on the surface (superior aerodynamics, IRST) – is essentially a corporate welfare project. I adressed IFF in my articles about BVR combat and latest air superiority fighter proposal, you might want to check these. I’m not exactly in position to write extensive articles right now. It is a little more delicate. You do not want to fan the fires of nationalism with in Russia and neither do you want to completely eliminate her influence in neighbors that would otherwise devolve into anarchy. Russia does provide stability in that regard. But you can’t allow land grabs of that sort against weaker neighbors with out cost. The strategy is being used by China also and there it will lead to violence. By the way, Ukraine is vulnerable at the moment and unable to exact a high price from Russia for taking over the Crimea. But that might not be true in the future. And the Europeans will react to this. Agreed, except that Russia is burning hot with anger right now, that Putin has transmutated into nationalistic madness… When of course it’s deep down generated by Putin’s brutal dictatorship. Patrice; Right… you are referring to labor participation in the work force among the age group cited. I will buy your number as being in the general vicinity of reality and being very low by historical standards which is why “real” unemployment is estimated at twice the official statutory rate of 6 or 7 percent. If it comes to that war in the Ukraine will be by proxy. They have the population and the land mass that will allow for a stout defense. The problem that you westerners seem to ignore is that Crimea never actually belonged to the Ukraine. Ever since it was conquered by the Tarist Empire in the 19th century it belonged to Russia. It was transferred from the Soviet Russian Republic to Soviet Ukrainian Republic in an INTERNAL resettlement of administrative borders of the USSR in the 1950s under Hrusciov’s, a native of Ukraine, administration. It has a majority Russian population not Ukrainian and is thus viewed by Russians as Russian territory that they conquered fair and square form the Ottoman Empire almost 2 centuries ago. So it is very hard to claim that it is a “land grab” from another country when that country didn’t even exist 3 decades ago, let alone have a legitimate claim to that territory stretching back 2 centuries. Thanks. So Crimea is Russian by a historical right. I asked for details on a forum before, but I didn’t get a good answer. Actually even longer then I thought. I just checked and it was conquered by the Russians in the Ottoman-Russian war of 1768-1774 and officially annexed in 1783. So actually more then 2 centuries. Back then there wasn’t even an Ukrainian national identity which began to form after the Russian disbanded the Zaporozhian Cossack Sich. Andrei, with pop culture being what it is we are all Westerners any more. Patrice… you are correct. Russian never lost its quality of Empire in the old sense. It is a collection of nationalities that because of many reasons have never been incorporated into the body-politics and economy of Russia proper. A lot of that has to do with the exploitative tendencies of the “gentry” in old Russia that made up just 5% of the population with all others reduced to the level of “serfs”. That type of exploitation is ingrained into the national psychic the same way that in the USA the old Southern families struggle with a multi-cultural and socially diverse society. Russians are very racist. Andrei: If you are going to say that Ukraine did not exist three decades ago, neither did Russia. That’s an interesting viewpoint. In other news, Moscow certainly did not exist 7 centuries ago. However Prince Vladimir (!) of Kiev ruled over Crimea, in the Tenth Century. Further back, the Greeks owned Crimea, 25 centuries ago. However, Stalin expulsed them in 1944. The rest of the world is tired to hear that Stalin made history right, and see that absurdity enforced with sheer violence. Should you want to learn certifiably true history, you can consult my site. Andrei gave the official Russian version of history. He forgot to mention a few important facts. First of all, Russia is about five centuries old, as a state. Crimea, eleven centuries ago, was Ukrainian. Crimea is not Russian historically by right, except if one believes that recent (1853 to 1944) holocausts are right. Also that it is right to outlaw the return of the Tatars to the homeland that they were deported from (1967). In truth the youngest son of Alexander Nevski, the hero of Novgorod, founded a little ford in the woods, at the crossing of several rivers. It allied itself with the Mongols against the local populations, extracting tax from them. That little thing in the woods grew into a mighty ally of the Mongols, the Duchy, or Principality of Moscow. This dubious birth perfectly incarnated by the first Czar, Ivan IV The Terrible has carried, over the centuries the most… terrible land grabbing capability in the world. This is why the Russian empire grew into the world largest empire that ever was, up to 22 million square kilometers (it’s 17 million sq km now; USA, Canada and China are around 10 million square kilometers). There are several essays on this subject, including historical maps, on my site. What Andrei is saying that lying about Russian historicity is more important than truth and human rights… And that Ukraine is Russian. Just like Georgia is Russia. In truth, Georgia is many times older than Russia (and Russia occupies 20% of its territory). Russia’s corrupt and collaborationist birth has insured that it has a mentality inimical to all and any civilization that is not Moscow. Patrice the moment that you try to school me about history by saying that Ukraine is 11 centuries old is the moment you prove that history is not your strong point. The Kievian Rus that formed the Cnezate of Kiev 10 centuries ago had about as much in common with modern Ukrainians as the swedes do because guess what they were vikings, that ruled a collection of people of multiple ethnicities: proto-romanians, slavs, cumans magyars and whole lot of other people, that had accumulated over the centuries in the territory that is modern day Ukraine. The Cnezate of Kiev lasted until it was passed through sword and fire, to use and expression from my language, by the mongols, most of which then settled in the Crimea and became the Tatars. Estimates of the casualties suffered by the Kievian Rus at the hands of the mongols are as high as 90%. The territory that is now Ukraine then passed to the Kingdom of Poland and subsequently to the Polish-Lithuanian Commonwealth and was gradually resettled by these two entities . Being a borderland of these two entities and subject to repeated raids by Tatars, Ottomans and the occasional Moldavian punitive expedition when the Polish kings intruded too much in Moldavian internal politics, it was sparsely populated with the Polish magnates, sharing it’s rule, boasting powerful private armies and being very powerful and incredibly cruel with the peasants and serfs under their rule. This cruelty lead to the peasants and serfs repeatedly running away and accumulating in the area of the lower Dniper were they started calling themselves cossacks and formed the Zaporizhian Sich, which in time became tolerated by the Polish authorities. Some of the cossacks even served in the armies of the Polish crown and the Polish magnates, they were called registered cossacks. In fact by about the 16th and 17th centuries most of the regular non-mercenary polish infantry, was formed from registered cossacks units. You see when it comes to cossacks Russians lie about two things: 1) that they were Russian. They were not. In fact every person that reached the Zaporizhian Sich and passed the tests became a Cossack and could rise through the ranks to leadership positions. For example in the 16th century a Rumanian the brother of Moldavian voievode John the Valiant rose to the position of ataman of the Zaporizhian Sich. 2) the second fact that the Russians lied about regarding cossacks was that they were cavalry. In fact compared to the Polish, Rumanians and Tatars they sucked as cavalry. They were however supreme infantry, even going so far to regularly use trench warfare in the 17th century. And they were also pirates, having a large fleet of light ships which they used to raid Ottoman holdings as far south as the outskirts of Constantinople. In addition to forming most of the regular infantry of the Polish-Lithuanian Commonwealth the Zaporizhian Cossacks had another important role: they were the first line of defense against Tatar raids launched from Crimea and they in turn raided Crimea keeping a constant pressure on the Tatars and gradually, by the 17th century, neutralizing theme as a combat force. All these important contributions to the defense to the Polish-Lithuanian Commonwealth didn’t make the magnates reconsider their attitude towards their subjects in the Ukraine in general and the cossacks in particular. They continued to oppress them, disdain them and generally be as cruel and greedy as their stations allowed them. These resulted in repeated rebellions by the Cossacks in the 16th and 17th centuries which usually extended to the whole population of the Ukraine, which were brutally put down by Polish Crown. All these rebellions culminated in the middle of the 17th century with the Khmelnytsky Uprising that finally broke a big part of the Ukraine from the Polish Crown, this is also the first time that the people of the Ukraine started calling themselves Ukrainians. They however didn’t become independent as Khmelnytsky, the hetman of the Cossacks first allied with the Russian Empire and then became the vassal of the Russian Empire. That is the first time the Russians start having influence in this part of Europe. Now we have a saying in my country which can be roughs translated in English as: Don’t thrust Ivan because he will take you sofa. Thrust me it sounds better in my language. The reason why we have these saying is perfectly illustrated by what happened next with the Cossacks and Ukraine. The Russians moved on the Cossack sofa (Ukraine) and started considering it their own. In a few short decades the Cossacks moved from being allies to being a nuisance, the Russians started oppressing them even more then the Polish did, and gradually moved to exterminating them in the 18th century. By the time of the annexation of Crimea the Zaporizhian Sich had been destroyed and what was left of the Cossacks were thoroughly broken and integrated in the Russian Empire as border guards, and the Ukraine was divided between the Hapsburg Empire and Russia together with the rest of Poland. What happened with Crimea during all this time? Was it ever a part of Ukraine or a Cossack holding? No. It wasn’t. Crimea was a vassal of the Ottoman Empire ruled by the Tatars. The only time when Cossacks and Ukrainians were ever in Crimea prior to it’s annexation by Russia. was when they were raiding it. Saying that 11 centuries ago Crimea belonged to the Ukraine is equivalent to saying that 11 centuries ago Crimea belonged to Romania, Croatia, Serbia, Bulgaria, Poland or even Hungary, because at that time (9th Century AD) those were the people that lived in the area, Slavs (that would become Croatians, Serbians, Bulgarians, Poles and Ukrainians ) and Magyars (that would become Finish and Hungarians and were related to Ottomans ) were in the process of migrating in the area and pushing away proto-Romanians (that would go on to become Romanians) cumans and other older populations that had settled in the area and would be completely assimilated in the new people. After it’s annexation by Russia, Crimea was ethnically cleansed by the Russians which became the dominant ethnicity, with the Tatars becoming a largish minority. I never said Ukraine or Georgia was Russian. In fact when did I talk about Georgia? I only said that Russia has currently a more solid claim to Crimea then Ukraine has. How that claim was obtained is not the point here. If we were to take into consideration righting past wrongs and giving Crimea to it’s rightful owners then all Russians and Ukrainians should be evacuated and Crimea left to the Tatars. But by the same measure all Italian-americans, Irish-americans, African-americans, Latino-Americans, white-Anglo-saxon-protestant Americans and all other types of Americans other then Native-Americans should be evacuated from the USA, Mexico, Canada, Venezuela, Columbia, Brazil, Argentina, Uruguay etc. and the Americas left to the Native Americans, because what happened in Ukraine, Crimea and Russian occupied territories, was in no way different then the way America was settled, or should I say resettled. Excellent piece of writing and in English no less which I assume is your second language. I am familiar with Russian history from college and can recall enough to give your account of this history a lot of credence. The Crimea is very important strategically; In an age of fast fast aircrafts and guided missiles you are but a stone throw away from a number of other countries so Russia being there is not good news for them. It is like a mortal enemy of the USA taking over the Bahamas. Georgia and others are interesting too. It is about where Russia’s border land with the old Ottoman and Persian Empire was located and extremely important for the security of all of them. With oil and the pipelines now even more so. This is not finished yet. Russia will probably continue to jockey for more control of these strategic areas. And the history of sanctions, etc. is that when in place against an authoritarian regime they can last for years if not decades. We will see where this all goes. You are right. And as a Roumanian, only a stones trow away from Crimea it makes my blood run very cold to think that the Russians are officially back there again (unofficially they never left). On the other hand it is very hard to contest their ownership of Crimea at this time without going to war. And the thought of a war this close to my country a war that will most likely spill over the border in my country at a moment when due to incompetence, over-reliance on NATO and a wish not to antagonize our neighbors and “upset the balance of power in the region” the military of my country is practically disarmed, makes my blood run even colder. Russia will not continue it’s expansion in Ukraine. At the moment it dose not have the economical, military and financial might to risk being politically isolated and Putin is no fool to try to antagonize the West anymore and risk loosing anymore western capital. Most of the blame for what happened in Ukraine rests with the EU, specifically with the “old Europe” part of the EU that are neglecting a common European energy policy, are using new Eastern European EU members as sort of colonies and are completely ignoring a common defense of Europe and prefer to rely on US help. Western European countries have been practically bribed by Putin with cheep gas at the expense of Eastern European EU members and non EU states that have been stuck with the bill. For example Rumania pays twice as much as Germany for Russian gas and Ukraine on a good day 3 times as much. Also every proposal for negotiating a single price on Russian gas for the whole of EU has been shoot down by France, Italy and especially Germany. At the same time, Germany especially, is using its control of the banking system of the Eastern European states (for example out of seven large Banks in Romania 6 are German owned and only one French owned ) to funnel capital out of their economy and use it finance Germany’s own economy stunting the economical development of Eastern European countries and keeping them as a market for the surplus of products that the export oriented German economy is producing. In this environment practically the economic heart of EU (Germany) has no interest in creating a more unified EU because it looses the markets of Eastern European countries. This in turn has detrimental effects on EU external policy because it keeps the EU divided and incapable of forming a unified response to outside threats, the blocking by France of an Arms Embargo on Russia to complete their sale of two Mistral class ships is a case in point of this. Bottom line is at the moment with the US shifting it’s focus from Eastern Europe to China, the only power that can stop more expansionist attempts by Russia is EU. But EU will never be a true power until it fully integrates it’s eastern European members and shifts from being more of an alliance of states to being more of a Confederation of states. “are using new Eastern European EU members as sort of colonies” – I have never heard it put this way but if it is then it will stun the growth of Eastern Europe by flooding the market with goods and exporting commodities and cheap labor in exchange. You have talked about the banks before and I have mentioned that the real danger is not capital infusion but capital flight. Most treaties dealing with trade want capital flows not to be interrupted and when capital is flowing-in all is OK (all correct, that is an Americanism) but by the same rule when capital flees in a fire sale economies can collapse. Same for creditor rights taking precedent over debtors. A life’s work can be destroyed this way. All developing countries should insist on capital inflows to be permanent through minority ownership in stock companies rather than debt or better said that debt ratios be kept below say 30% of all capital so the bulk of the investment cannot flee in a panic. Also insist that in key industries like agriculture, mining, communications, transportation and ports, etc. the ownership percentage be non-controlling as well as the industry itself be non-monopolistic or else be treated as a Utility. This is standard in most developed countries like the USA where approval by the Federal Trade Commission is required for large deals and utilities are subject to strict regulation and oversight to avoid exploiting consumers. Large investors and creditors do not like these rules since they prefer to enter the economy through monopolistic businesses and through the bank system either directly through ownership or indirectly like they are doing in Turkey. But it is better for the developing country and reasonable investors while harder to find are not completely absent. in my country the leaderships privatizes key industries at bargain prices allows foreign companies to have monopolies and they don’t even have the concept of Utility, electric energy is traded on a market like other goods. While capital like I already said flows out of the country like the Danube. The only small stop to it are interventions by the National Bank which is the only body trying to impose some order in this chaos. So… we are pretty much …. well you know. Right… and they will pollute the environment at a scale that would be unimaginable in their home countries. Bolivia, Ecuador and of course China. In South America rail, ports and mines where developed by foreign interests maybe a hundred years ago. Then communications like cell telephones, etc. where the next target. The preference is always for capital intensive industries that can consume surplus capital from the investors AND at the same time the industry enjoys high pricing power, high barriers against competition and few alternatives. It is a play-book. Chile, Peru, etc. But Banks are really the most chaotic of them because of the liquidity issues and because credit if politicized can create the illusion of wealth albeit just temporarily… Argentina is a good example. Rational governments try to regulate banks with non-political appointees… not easy. Cyprus just had a bank scare… right? I’d have to agree that Russia’s claim does have some legitimacy, based on history. I think that part of this is from a failure on the West to empathize with Russia. At the same time, there’s the matter that NATO itself has not been honest. They broke their promise to not expand Eastwards and they want to incorporate the Ukraine into Russia, plus set up a missile defense system. That said, there’s been a lot of wrongs and a lot of bitterness from all sides. Thanks though for taking the time to write the history of the Crimea area. It is quite interesting, and in many ways, quite unique. Looking forward though, the question is, what happens now? At the moment, it seems like mostly toothless sanctions and most empty words coming from the West. If you think that then you would agree that the Spanish frontier should be north of the Pyrenees since that is where it used to be. And Charlemagne was king of Franks and Lombard which would give Germany a solid claim to northern Italy. According to the Chinese Tibet is part of China. Where would you end? Actually I tend to agree that Tibet is a part of China. There have been historical disputes for sure though. Among the European nations, France and Spain are not in a dispute over the Pyrenees to the best of my knowledge, although there are multiple separatist groups in Spain. Germany and Italy are not in any territorial disputes right now. Turkey is on the brink of having a banking crisis. Took loans in foreign currencies. With their growth stalling the currency risk can add to the debt since they must sell their depreciating currency to buy an appreciating foreign one and pay-back the oan. They will be lucky to get out of this with just a bruise. But who are we to be talking. The Chinese poured capital into our economy that we then invested in housing for more Americans than we got… look at what is taking to work that out. Well, this being the defense industry, I imagine they’ll use this as a justification to try to convince politicians to buy more F-22s. 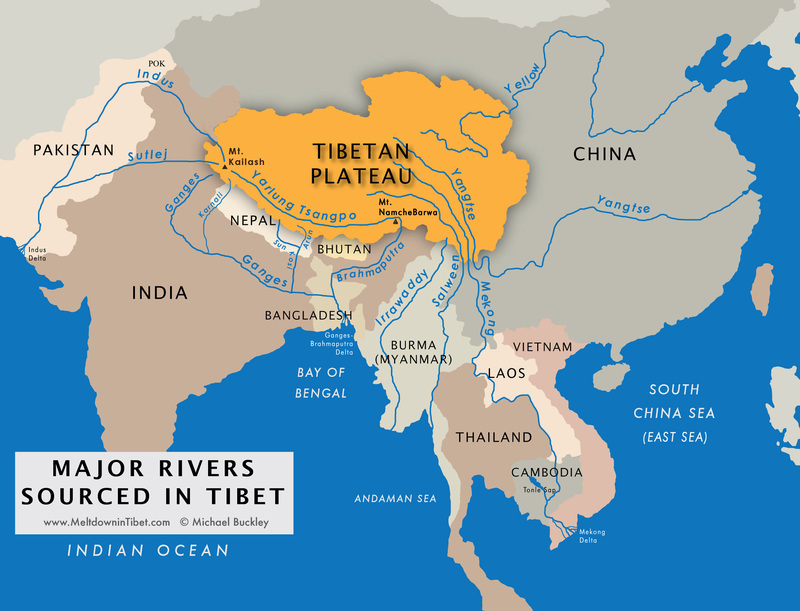 Chris, look at the head waters located in Tibet and you will see the real reason it is disputed. It has nothing to do with historical or ethnic rights. It is all about geography and the threat to those countries that depend on those rivers. Control of those headwaters is what all this conflict is about and the fact that whoever does can cripple the development of its neighbors. China is at the present in the driver’s seat and wants to retain it for its own security as well as to influence their neighbors. As far as European border disputes do not under estimate the effect of propaganda and political speech on public opinion… it can erase all rationality and substitute it with reckless passion. Just like Russians can be talked into believing that Crimea was part of Russia and not disputed border land so can the Germans be led to believe that Lombardy is historically theirs. Has been done before. A lot of it is water. But it’s also about power elsewhere – especially in the case of economic power. The F-22 has decent maneuverability (I am not claiming its the best) It has excellent BVR (Maybe the best but BVR has to evolve over the next decade in order for F-22s to be efficient). However pilots have to make good use of these capabilities. Agreed. But BVR will likely turn towards the passive sensors as turning on the radar isn’t safe – both F-22 and Rafale can use opponent’s own radar emissions for targeting, and number of aircraft with such capability will only increase. What exactly do you mean by that? This blog is a free wordpress domain, nothing special. My pal indicated I could similar to this site. He / she was once entirely correct. This informative article actually built our time.. Marketing Tips You can not consider purely what sort of good deal time I’d spent due to this info! Thank you so much!